Sen. Harry Reid says differences between the two bills are "fairly minor"
(CNN) -- Now that the Senate has passed its economic recovery package, it's time for the really hard part -- trying to reconcile the differences between House and Senate versions of the plan without losing the support needed to pass the final version in both chambers. Senate Democrats are downplaying talk of a contentious battle ahead. But differences in price tags and priorities will test the mettle of negotiators who hope to have legislation on President Barack Obama's desk by Presidents' Day. The final vote in the Senate was 61 in favor and 37 opposed. The same three Republican senators who helped the bill survive a key test vote Monday -- Sens. 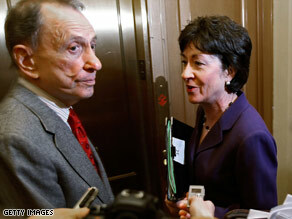 Susan Collins, Olympia Snowe and Arlen Specter -- again broke ranks to support the bill Tuesday. Staffers started negotiations even before the Senate voted on the package. Senate Majority Leader Harry Reid said Tuesday that lawmakers would work through the night, if necessary, to come to a consensus. "It's been a long, hard struggle to get where we are, but we're here," said Reid, a Democrat from Nevada. "I think the differences really are fairly minor, and we're going to work very hard to resolve those differences as soon as we can." Reid said he hoped to have much of the work done within 24 hours and predicted the final legislation would be ready before Congress goes on recess, scheduled for the week of Presidents' Day. Meanwhile, the vast majority of Republicans are making it clear that the plan does not have their support. Senate Minority Leader Mitch McConnell said Tuesday that the bill "fails the test as to what a stimulus package ought to be," noting that of all the Republicans in Congress, only three found the bill acceptable. "The rest of us did not. We think, as we have repeatedly said, that it's entirely too large ... and more than anything else, it's not timely, it's not temporary and it's not targeted," said McConnell, R-Kentucky. Democrats on Tuesday defended the scale of the proposals -- saying something dramatic is needed as the nation's economy continues to worsen. "Because tens of thousands of Americans are losing their jobs every day -- 600,000 of them lost their jobs in the month of January -- we cannot lose any time in stopping that, by passing the economic recovery package," said House Speaker Nancy Pelosi. The House version includes more spending on education and aid to states, totaling about $100 billion. The Senate version of the bill also makes changes to the president's signature middle-class tax cuts. Obama had campaigned on tax breaks for those making $75,000 or less. The Senate version provides tax breaks for individuals making $70,000 a year or less or for couples making $140,000 a year or less. That's different than the $150,000 in the House bill. • The Senate bill, unlike the House version, would make the first $2,400 of unemployment benefits tax-free. Both the Senate and House bills extend the time that jobless workers can collect benefits. • The Senate bill includes an amendment that would let those who buy a car in 2009 deduct the interest they pay on their car loan as well as the sales tax charged in the purchase. The House bill doesn't include this provision. • The Senate bill doubles the House's tax credit for first-time homebuyers to $15,000, a measure championed by Republicans in the Senate. But House Democrats have a difference in priorities, said Rep. James Clyburn, D-South Carolina. "Once again, if the Senate wants to keep a ceiling on this bill somewhere around $830 billion, House Democrats do not have a problem with that," he said. "Within that $830 billion, we do have some ideas about what is more stimulative and what is more accountability, and that's where I think we're going to have some negotiations." The House bill passed nearly two weeks ago, without a single Republican vote. The three Republican senators who crossed the aisle to get the plan passed are making it clear that their support for the final product isn't guaranteed. "My support for the conference report on the stimulus package will require that the Senate compromise bill come back virtually intact, including, but not limited to, overall spending, the current ratio of tax cuts to spending, and the $110 billion in cuts," said Specter, of Pennsylvania, in a statement Monday night. Collins also said that if she loses a lot of what she negotiated in the marathon sessions last week, Democrats won't be able to count on her support. Democrats will need at least some GOP support for the package in order to pass the 60-vote threshold needed for passage of the bill. Sen. Charles Schumer, D-New York, insisted Tuesday that Democrats are willing to work in a bipartisan fashion to try to entice even more Republicans. "We will do our best to bring more Republicans over to our side. And I hope that happens this week. And we will be open to new suggestions just as we were to $106 billion in suggestions that were added to the bill," he said. "But we will not sacrifice the focus of this bill -- jobs, tax cuts for the middle class and infrastructure -- for anything." "We can't wait and see and hope for the best," he said. "I believe in hope, but I also believe in action. We can't afford to posture and bicker and resort to the same failed ideas that got us into this mess in the first place." During a prime-time news conference aired nationwide Monday night, Obama also called for an end to partisanship on issues like economic recovery. "My whole goal over the next four years is to make sure that, whatever arguments are persuasive and backed up by evidence and facts and proof that they can work, that we are pulling people together around that kind of pragmatic agenda," he said. CNN's Brianna Keilar and Dana Bash contributed to this report.